Rockstar has released the iPad version of “GTA Chinatown Wars”. It is similar to the previous Chinatown Wars available for the iPhone but the iPad version takes advantage of the iPad’s larger display so it supports 1024×768 graphics. 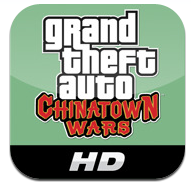 Grand Theft Auto: Chinatown Wars HD cost $9.99 and is available on the App Store. Not available in the Saudi Arabia App Store, fix this please, Rockstar. Rockstar also confirmed that they will release some of their Grand Theft Auto PC games for the Mac as well. The company said: “Look for the long-awaited released of the classic Grand Theft Auto Trilogy (Grand Theft Auto III, Grand Theft Auto: Vice City and Grand Theft Auto: San Andreas) for Mac — most likely later this year,” Rockstar had been able to confirm. Via: MacLife – GTA Pack Coming To The Mac.